Back by popular demand, and a request from our friends at The Statesman Journal (see the article for more info), below are job polarization maps of the Salem region. Just like the Portland Maps previously, this is census tract level data that examines the share of residents in each broad wage group (high, middle, low). As such this not actually polarization per se, but rather where people live. The American Community Survey occupational groups are slightly different than the Bureau of Labor Statistics ones, however they are very similar overall. Many thanks to the Oregon Geospatial Enterprise Office for mapping the data for us. 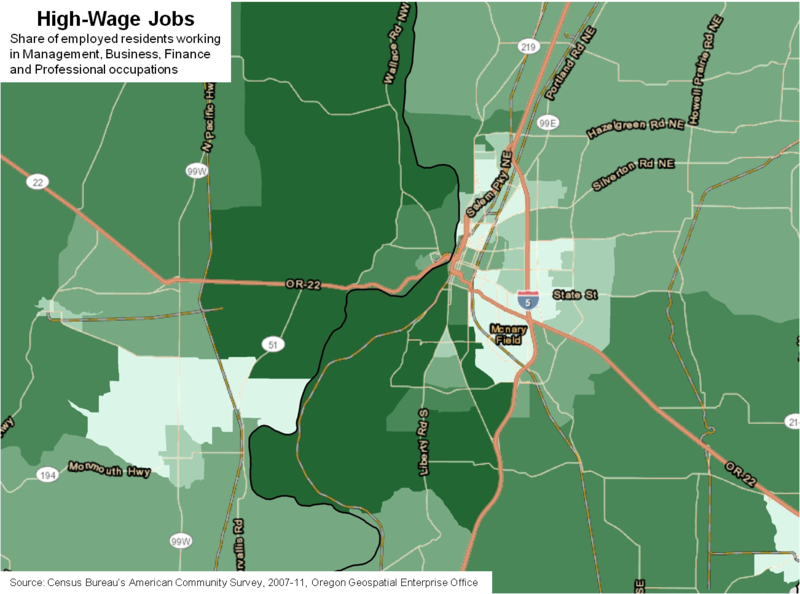 The first map shows concentrations of high-wage jobs in the Salem region. The largest concentrations are clearly in the South Salem and West Salem areas, with relatively few east of the river or I-5, including downtown Salem. These could also double as maps of home values, given that in general, the more income one has, the more expensive housing one buys or rents. 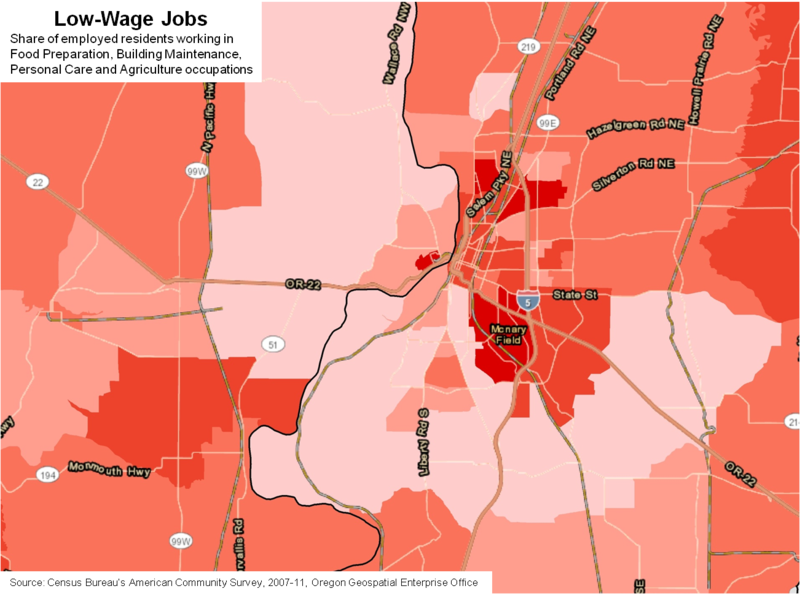 When it comes to the middle-wage jobs, the map is effectively a mirror image of the high-wage one. Larger concentrations are seen in the region east of the Willamette (along Highway 22 and up by the fairgrounds and into Keizer) and further west, closer to Dallas. The dark orange census tract to the north is the very northern end of the Keizer city limits. Where the patterns are a bit more concentrated are among the low-wage job holders. Keep in mind that these are not the majority of job holders and I believe in only 4 census tracts in the whole state do low-wage jobs make up the majority of employed residents. However, the concentration of low-wage job holders is a bit more pronounced then the other wage groups. Here you can see higher concentrations in and around the downtown portion of the overall metro. Particularly in the Northgate/Keizer areas to the north and then Morningside/Southeast Mill Creek areas between downtown and I-5. Also, as pointed out by Sue Porter at DHS/OHA (and OEA alum), these concentrations of low-wage jobs tend to coincident with “High Poverty Hotspots.” Marion County starts of PDF page 139 in their report for those interested in reading further. Our Job Polarization in Oregon report focused on trends at the state level and had some discussion on the urban-rural split in job growth, however these processes can be experienced and observed even down to the neighborhood level. Examining such changes — polarization, economic sorting, integration/segregation — is very interesting and with another year or two of ACS data, we can get good numbers locally as well to compare pre-recession and post-recession trends. This also has been shown to have big implications for economic mobility, as discussed previously. In the future, we hope to work on producing such maps once more data becomes available.